One of the constants of working in a warehouse is dirt and dust; even if you work mostly in a warehouse office as a supervisor or logistics manager, you’ll still be familiar with the gritty feeling of dirt under your collar at the end of the day and the crunch of warehouse debris beneath your work boots. Keeping a warehouse clean is a never-ending struggle that can take up a lot of your employees’ time without seeming to make a real difference in the levels of dust in your facility. Reducing dust in the warehouse is about more than just tidiness. Warehouse dust is made up of particles from different sources: soot from forklift exhaust, biological matter like mold spores and outdoor pollen, wood dust from pallets, detritus from warehouse pests, and any number of other types of particulates that you don’t want your employees or end customers exposed to. To keep your employees and customers safe, we’ve got tips for reducing dust in your warehouse and keeping it at a manageable level. Warehouses and warehouse machinery are full of difficult-to-access areas. These hidden places collect dust which goes unnoticed until it is stirred up again when machinery and personnel are back in motion the next day. Ensuring that employees know where these areas are means they can sweep or vacuum out any accumulated dust during a daily clean-up and reduce the level of debris and particulates in your warehouse. Once your employees have been trained on how to keep their workplaces clean, it’s necessary to ensure that they actually put in the effort needed to keep them that way. Employees should understand exactly what areas they are responsible for and should know that keeping their work areas properly cleaned is one of their core responsibilities. Implementing new cleaning procedures doesn’t mean much if they aren’t followed. Ensure that your employees follow through on cleaning their work areas by implementing periodic inspections by direct supervisors. Regular inspections that include out of the way and hidden areas will increase the likelihood of your employees properly disposing of dust and debris. If warehouse cleanings have been infrequent for a long time, you may actually want to stop operations for a complete and thorough cleaning. Often, dust in your warehouse isn’t a sign that cleaning the warehouse is ineffective, but that cleaning is done infrequently or to an ambiguous standard. Implementing clear standards and taking measures to ensure that your employees carry out cleaning consistently can greatly reduce dust in your warehouse. If warehouse cleanings have been infrequent for a long time, you may actually want to stop operations for a complete and thorough cleaning. In some cases, however, simply cleaning more vigilantly isn’t enough. If your product produces excessive amounts of dust, if even a small amount of dust could damage your product, or if the dust itself poses an extreme hazard, you may want to consider specialized anti-dust equipment. Fogging Systems: Fogging systems spray a constant light mist of water into the warehouse atmosphere. These small water droplets collide with dust in the air and pull it to the ground. This is the preferred method for preventing grain dust explosions. 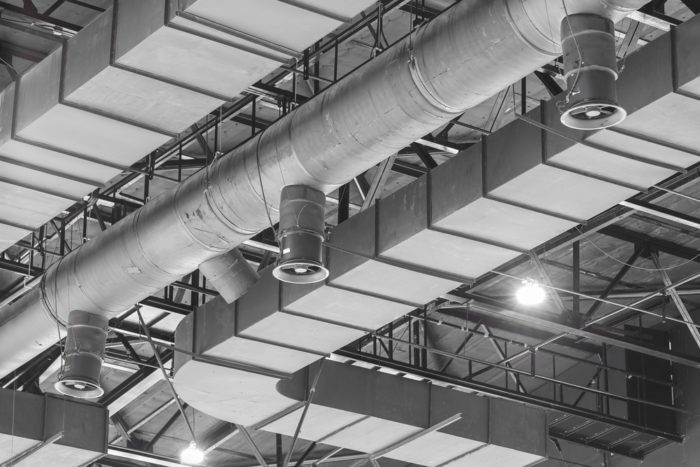 Ventilation Systems: Dust suppression ventilation systems use extractor fans to move air through filters which trap the dust before the air is then pumped back into the warehouse. Partitioning: A system of impermeable partitions can prevent dust from moving from one part of a warehouse to another. This can keep dust from the outdoors or from production processes from entering the sensitive parts of the warehouse. Filtering systems usually run continuously, and filters and other parts of the system need to be checked regularly. Fogging systems are generally confined to bulk grain warehouses where the dust they are knocking out of the air is part of the product. In other types of warehouses, dropping airborne dust onto surfaces below isn’t particularly helpful and raising atmospheric moisture can cause other problems. Dust filtering ventilation systems are commonly built into clean rooms, but are not in widespread use in most warehouses. They use an intricate design to maintain air pressure and ensure that air flows properly through the system. Filtering systems usually run continuously, and filters and other parts of the system need to be checked regularly. This makes them too expensive for most warehouses to use. Partitioning is a commonly used, inexpensive way to sequester sensitive areas from the outdoors or areas onsite where dust-producing operations are taking place. Plastic sheeting hanging from a door jamb overhead is a common sight in facilities that are part of the dairy and food supply chain. However, partitioning does need to be combined with an effort to prevent sources of dust and other debris from entering the warehouse in the first place. Dust enters warehouses in many ways and in many forms, but one reliable source of dust in nearly every warehouse is the ubiquitous wood shipping platform that products travel on. Wood pallets decay over time, and the friction caused by heavy loads or by powerful machinery can cause wood fibers to fray or break loose, leaving dust and other debris behind in your warehouse. If you’re serious about reducing the amount of dust, dirt, and debris in your storage facility, you need to make an effort to keep wood pallets out of controlled areas. 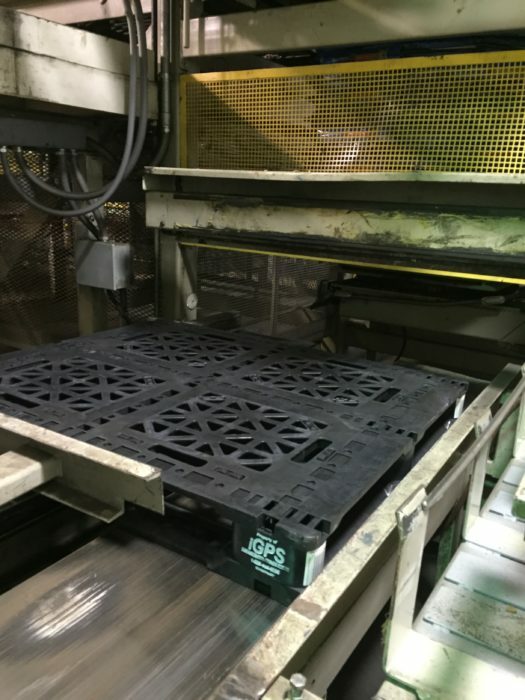 Plastic pallets do not break or fray when they encounter heavy loads and friction from warehouse machinery. Heavy-duty plastic pallets can be used in place of wood to reduce dust in your warehouse. Plastic pallets do not break or fray when they encounter heavy loads and friction from warehouse machinery. Their single-piece unitized construction means that they are also less likely to break and create fragments or debris that may later become dust. Switching to hygienic plastic GMA pallets is a simple and effective way to reduce dust in your warehouse. The iGPS pallet pool offers a durable, resilient plastic pallet that doesn’t fragment, enabling you to eliminate wood dust and debris in your warehouse. Give our team a call at 1-866-636-6443, email a specialist at switch@igps.net, or visit our contact page.